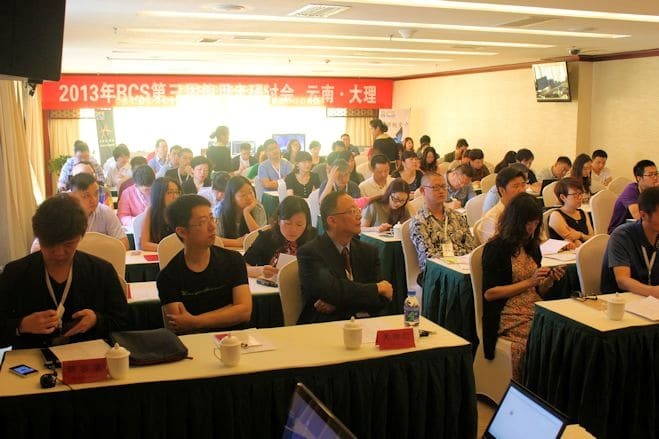 We recently hosted a terrific RCS User Conference in China. Alex Meng, our managing director there, picked the smaller City of Dali, a mild temperature and touristic destination in Southwest China as the conference backdrop. Many of our clients’ operations managers made the trip and by having the presence of some of the largest radio networks in the country, the RCS conference earned its stripes. China National Radio, for example was there. The first radio station set up in 1940 by the Chinese Communist party covers today 92% of the country’s population with 8 channels, each broadcasting to several hundred million listeners: they put the “broad” in broadcasting… and they use RCS! A lot of preparation goes into these types of events. So many topics to cover, current software workshops, new products demos, questions and answers. Below is a picture of one of the studious sessions currently under way. 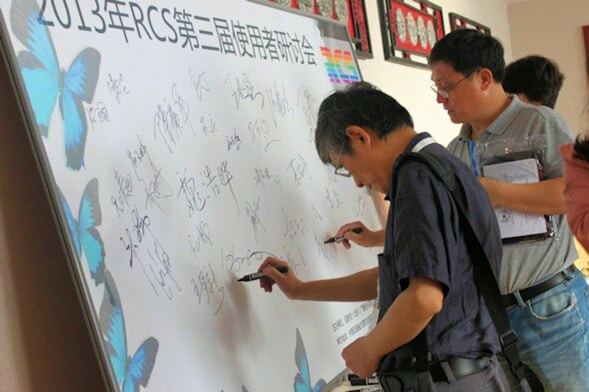 Delegates to the RCS China Users’ Conference sign in on the GSelector-inspired board! Back in the 1950s, my parents invested what then amounted to a month’s salary in a cutting edge piece of household equipment. No, it was not a refrigerator, a washing machine, or even a television. At that time, these items were comparatively so rare that you had more chance of being hit by a meteorite than walking into the average UK home and finding any one of them. No, what my parents invested in was a wonderful hunk of wood, which resembled, in profile, a huge cut of meat: The Murphy “Mutton Chop” Wireless. Not just a radio, but an embryonic family heirloom. In fact, this monolithic wonder, complete with its mysterious glass valves, now resides in my home office and reminds me of how I first fell in love with radio. In the early 50s, only the wealthy could afford the tiny-screened black and white televisions that were starting to appear. As prices started to come down, television would become the object of every family’s desire. Computers seemed like a science fiction fantasy. Even up to the early sixties, a portable tape recorder usually meant quite a bulky machine with perhaps 3 inch or 5 inch reels of open tape powered by batteries that lasted for about 15 minutes. The compact cassette quickly became accepted after its introduction in 1963, but it wasn’t until 1979 that the Sony Walkman popularized the first truly pocket-sized portable cassette player. For the most part, mobile communications from a car in the seventies only happened if you subscribed to a single channel two-way radio system where you had to pass your message through a radio controller, who in turn, passed it on to another mobile user or to a phone caller. The Nokia Mobira Senator of 1982 weighed 22lbs (9.8kg)! The first computer I saw in radio was in 1984 when my radio station purchased an early Apricot (British competitor to IBM and Apple) which we used to house a database of community information. Two years later, in 1986, we became only the third radio station in the country to use a computer to schedule the radio station’s music – and we were the first (by some margin) to allow a computer to program our radio station 24 hours a day. Of course, the software program was my introduction to RCS, in the form of what would become the legendary, Selector. Back then, the idea that one day the computer would not only schedule the music, but would also contain all the music – was futuristic beyond belief. It was difficult to imagine the economic storage of audio. At that time, most personal computers didn’t even have internal hard drives. Our earliest computers contained two 5 ¼ inch floppies – one contained the program and the other, the data. And remember, those early floppies contained less than a megabyte of information. It seems like only yesterday that computers broke through the 1 Gigabyte hard drive barrier. Colossal, we thought; now you can get a Terabyte on a tiny external hard drive. And the only thing you know for sure is that if you print this off and read it in 10 years, the idea that we could be impressed by a single Terabyte will be laughable. Of course, with hindsight, it’s all so obvious and easy-to-understand isn’t it? We could have all predicted how the future would turn out for us couldn’t we? And we’re just ordinary folk. It’s probably always been the way that really clever people can predict the future better than the rest of us, wouldn’t you think? Well, no, not exactly. At least radio is run by sensible people and surely our industry has a history of being forward-looking? Well, I won’t dwell on those who thought I was mad in 1986 to use a computer to schedule music. Then there were those who thought BBC TV’s future technology program, Tomorrow’s World were plainly on another planet when they featured the heavily computerized Pirate FM – the radio station I set up in Cornwall UK in 1992 – as an example of the radio station of the future. And, of course, there were those who were positively outraged when I introduced the UK’s first fully computerized radio station at Star FM in 1993 – the first time studio automation was used for protracted periods, rather than taking an overnight sustaining service (another form of syndication at the time). Star introduced the UK’s first intelligent automation system, (yes, you’ve guessed it, RCS Master Control), complete with voice-tracking. With RCS Voice Tracker and Internet Voice Tracking, most listeners think they are enjoying a live presenter. With the dazzling new Zetta playout system from RCS, one can do even more things. We are always moving forward. I have a feeling he was in the wrong job. We invent new ways of doing things every day. Years ago, I was hired by the leading local station in my far, far away hometown and the first thing I did was to replace our manual music rotation system by Selector. Using one of the just-released $2,000 black and white IBM PCs, I began to schedule music with a computer. Quickly I realized I was not alone in the discovery of this RCS groundbreaking invention: Music Scheduling. Other PDs I knew had already made the move to the digital world of scheduling. Together, we would have endless, passionate chats on the phone or at industry conventions about this new way of programming. I was always impressed with the way the people who used Selector had a unique bond. No matter what radio station, company or country we were from, we spoke a common language and understood radio as much through the legendary scheduling program as we did through our own experiences. I loved the innovative thinking of RCS so much so that I decided to join the company. Since then, RCS has grown to offer a complete suite of programs from Automation (did you know RCS owns the trademark Hot Keys? ), to Traffic and News systems. At RCS, we continue to pride ourselves with making sure every user has as much knowledge about our software products as those who develop them. We are pleased to introduce our reinvented newsletter, RCS CONNECT, as a way for us to keep you up-to-date on almost everything we are doing. Yes, even some the “secret” stuff that we are working behind the scenes on in our lab will be talked about in this mail. Selector2Go, for example, is the latest add-on to GSelector: We have all seen technology move faster than the speed of light from the Web 1, to 2.0, to a time when Social Media is driving the bandwidth. The era of Mobile, where phones and tablets will be kings of all platforms, is, in a sense, the Web 3.0 that some predicted. You might be reading this newsletter on a phone, right now. At RCS, we’re ready! Selector 2Go is the first system of its kind to allow PDs and MDs to create, edit and deliver their logs from a mobile device. RCS CONNECT cultivates two-way communication, which is the main ingredient that helped RCS become the world’s largest broadcast software company. Every issue has the button – What’s On Your Mind – a way for you to make suggestions, to tell us how things are going and for sure, to let us know how you think we can do it better. Philippe Generali is the President/CEO of RCS Worldwide.